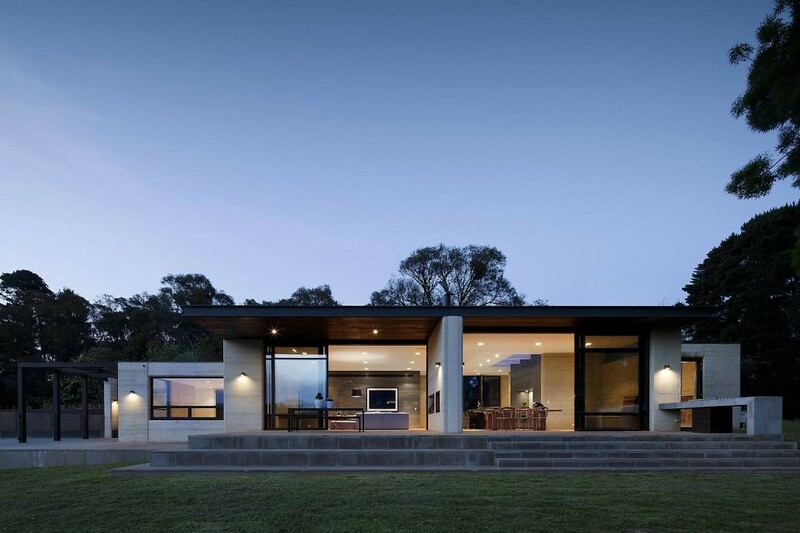 This inspiring single family house located in Merricks North, Australia, was designed in 2013 by Robson Rak Architects. The initial brief for the house was for a simple rectangular box with symmetrical spaces. The objective being for the creation of order and symmetry to simplify ones life. In addition to this there was to be no direct harsh light into the house; just a natural glow of light throughout. We convinced the clients that by breaking up this rectangular boxed plan we could create more interesting spaces that offered the order and quiet the client desired but also created a dynamic building which also offered surprising little retreats such as the window seat next to the fireplace. The ?Plane? tree outside the master bedroom to the south determined the planning and position of the house. The master bedroom was centered off this tree and the house and its zones extend to the west from here.